WASHINGTON -- It's a dramatic tale. Elite Navy SEALs storm a walled compound in Pakistan and take out the world's most wanted terrorist. Footnote: They were all men. While America's last 10 years of war have propelled women into new and far more risky roles across the military, there are still some doors that are closed. Chief among those are the special operations forces. But perhaps that door is inching open. "As a philosophical thing, there shouldn't be anything that's closed off as a career," said Navy Secretary Ray Mabus. And while he is quick to note that there is a ban on moving women into combat and infantry jobs, Mabus said more and more women are working with special operations forces in support roles. And he did not rule out the idea that a qualified woman could eventually become an elite commando. Still, Mabus cautioned that it would take time. "We're going to have to take some careful, well-thought-out steps in that direction," he said. Defense Secretary Robert Gates expressed a similar view late last year, telling North Carolina ROTC students that he believes women will eventually be allowed to serve in special operations jobs. At some point, he said, "there will be a careful step in that direction." One of those steps is the Navy's recent decision to allow women to serve on submarines. Of the 18 women selected for the program, eight will report to their submarines in November to serve as supply corps officers. Others will report to subs next summer. The first eight -- all are newly commissioned ensigns -- will be divided among four ballistic missile submarines, the USS Wyoming, USS Georgia, USS Maine and the USS Ohio. And there will be a senior female officer -- likely a lieutenant -- on each of the subs to serve as a mentor and work with the ensigns to help with the transition. "We are making a concerted effort to not only look at retaining women, but at bringing more women into the Navy," said Lt. Cmdr. Jean Marie Sullivan, chief of the naval personnel's office of women's policy. With the addition of those women to the subs, the only Navy jobs still closed to female officers are with the SEALs. By announcing the subs and putting a senior female officer on board with the two ensigns, the Navy says it is working to ensure a smooth transition that will gradually put women on attack subs. And, as more female officers merge into the ranks, they will pave the way for the eventual inclusion of enlisted women. Currently, however, the cramped quarters on subs don't provide adequate berthing for enlisted women, and it would be costly to make the necessary modifications. Overall, the Air Force has the highest percentage of women in its ranks, with a bit more than 19 percent. 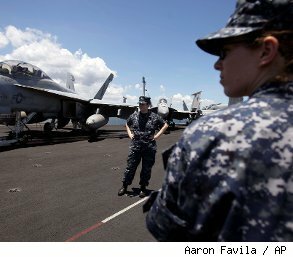 The Navy is close behind, with nearly 17 percent women, followed by the Army with 13 percent and the Marines with less than 7 percent. On Friday, women made up almost 21 percent of the 2011 graduation class of sailors at the U.S. Naval Academy at Annapolis, Md., and more than 17 percent of the Marines. Across the services, just a handful of jobs are closed to women, and those are mainly combat, infantry, artillery, pararescue, tank and special operations forces. The growth in the number of women in the military, and their increasing roles in the Iraq and Afghanistan wars, may be tearing down slowly the remaining walls that bar them from serving in front line combat. Earlier this year, a military advisory panel recommended that the final areas of discrimination be dismantled, bucking concerns that women lack the strength and stamina to fulfill those grueling jobs, or that the American public will balk at seeing large numbers of women coming home in body bags. Already more than 255,000 women have served in Iraq and Afghanistan and nearly 150 have been killed in those wars. And while women may not be SEALs, or members of the Army's prestigious Delta Force, they are increasingly serving with special operations teams in supporting jobs such as intelligence analysts, legal specialists, builders and administrative assistants. So, while the SEALs who stormed Osama bin Laden's compound early this month were all men, women have been deploying to the warfront with Naval Special Warfare Command squadrons for several years. Since 2007, 10 to 15 women have deployed with each NSW squadron, and more than 400 female sailors serve with the Navy's special operations forces in supporting jobs. That program temporarily assigns women to units that are close to the warfront, but it precludes them from doing combat missions. So far, said Sullivan, it has been very successful. "One of the things we are seeing is that as women move up and get more and more responsibilities, our retention rates for junior officers and junior enlisted are going up as well," Mabus said.